Days 55, 56 and 57 – Data! Over these three days I had 21 QSOs and only used the microphone once! The one time I used it I called a contest station who only wanted to work French stations so I tuned away. On the afternoon of day #55 I had a delivery from Slovakia. This parcel contained a microHAM USB Interface III which I’d ordered a couple of weeks ago with the proceeds of a pile of ‘junk’ I’d sold on eBay. Many years ago I used to operate a lot of data modes. I was a very early adopter of Packet Radio, experimenting with Cambridge Packet on the BBC Micro a long while before AX25 appeared and I used various ASCII methods of transmission using home-written software. I’d done nothing with data recently though and was looking forward to trying PSK31 and other modes. I’m not going to go into the details of PSK31 here except to say that I like it! It’s a very straightforward mode of operation and it’s possible (although it doesn’t seem common) to ragchew. Contacts are made using much less power than voice, all the QSOs below were worked using just 20 watts. On the afternoon and evening of day #55 I had 7 QSOs, all using PSK31. These were with Marco, IZ0MJF on 20m, then Franci, S51AB and OK1AW, Pavel on 40m. I switched to 80m and had a QSO with Steven, DO6UL then went back to 40m and worked UT1WR, Leonid. There was a lot of band switching on day #55 because I then changed over to 80m and finished off the day talking to Mirek, SP9ONC and Ivan, 9A1CCB. Day #56 was quieter with just three contacts, all in the evening and all on 40m. I worked SQ3JVN, Wlodek and then UT4EX, Yuri before finishing the evening by having a chat with Herbie operating the club station of Colchester Radio Amateurs, MX1COL/A. Herbie is just three miles away from me so to say he’s a strong signal would be an understatement! On day #57 I was up fairly early and took my usual trip to the bakers to buy bread, once I got home I switched the wireless on and had two quick QSOs,on 40m with F6ECI, Christian and DL4OCE, Arne. In the afternoon I looked at another data mode, JT65-HF. 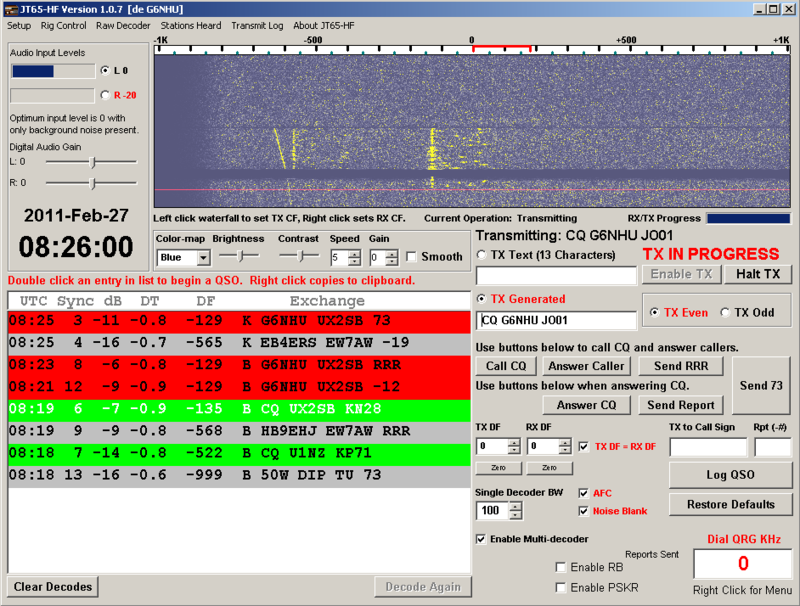 You can see the original CQ call (green background, white text), I replied to that with UX2SB G6NHU JO01, his reply is there, G6NHU UX2SB -12, I then replied with UX2SB G6NHU -07 to which his reply is shows as G6NHU UX2SB RRR and then I finished off with UX2SB G6NHU 73 and he sent a final 73. In the image, I’m in the process of calling CQ again. Signal strengths are measured in dB with the highest possible being 0. I had a QSO on 20m with HA5GY in Hungary using JT65-HF and then switched back over to PSK31 working Sergej, RZ3FS Tony, HA8RC on 40m before QSYing to 80m and having a QSO with Jan, DF1IAQ on 80m. I then moved back to 40m and switched to JT65-HF again to work YT1DL, RV9WKL and UX1IV before finishing off the evening by having another JT65-HF contact with M6AVL in Chipping Sodbury on 80m. JT65-HF is a mode that I really like, it’s clearly the geek side in me but I like the way that it’s so organised and straightforward with the details being passed in the most efficient way and the fact that a QSO can be made when the signal is barely audible to the ear. I can see myself operating this mode quite a bit more in future.